Mexico has traffic laws very similar to the United States. Mexico's law is what makes the differences, and the reasons for needing Mexican insurance. The law in Mexico is based on the Napoleonic Code where guilt prevails over the assumption of innocence. In the U.S., the law is based on the English Common Law where innocence prevails over the assumption of guilt. 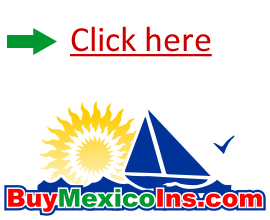 Mexico does not have compulsory automobile insurance. The basic difference between Mexico's and United States financial responsibility law is that anyone involved in an accident in Mexico must have the means to respond to damages or injuries for which they may be responsible....which in Mexico would be in the form of either cash or a Mexican insurance policy. Before leaving the U.S., you should ask if your U.S. insurance policy will cover your vehicle while in Mexico. If so, ask if the policy has restrictions or limitations in this regard, such as miles from the border, or number of days in Mexico, however, we recommend you to purchase a Mexico Auto Insurance policy from someone you know and trust such as GE Seguros Tourist Auto Policy. To buy now click on the picture to the right! IMPORTANT: Whether or not your U.S. or Canadian Auto Insurance policy covers you in Mexico, LIABILITY Only while in Mexico by a Mexican Insurance Company should be purchased. The Liability coverage on your U.S. or Canadian Insurance policy, is not recognized by Mexican Authorities. Only a Mexican Auto Liability policy is acceptable.